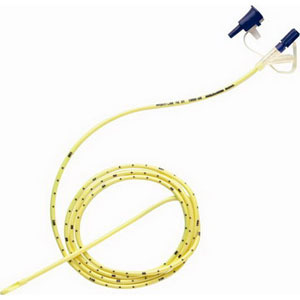 CORFLO Ultra Nasogastric Feeding Tube, 12 fr 36"
The Nasogastric Tube (NG) is used for those individuals who are unable to ingest nutrients by mouth. It is placed in either nostril, passed down the pharynx through the esophagus and into the stomach and is usually used for short term feeding. After placement is checked, it is then secured to the nose with tape. The amount of tube required can range from 36" to 45". It is usually made of polyurethane or silicone. The ULTRA anti-clog outlet port significantly reduces the occurrence of clogging. Used to provide nutrition to patients who cannot obtain nutrition by swallowing. The largest selection of adult, pediatric, and neonatal feeding tubes to allow one-stop sourcing for all your feeding tubes hospital or system-wide. Patented TRAK feeding tubes: The ONLY feeding tubes that can be used with the CORTRAK® Enteral Access System. Y-ports on all CORFLO feeding tubes minimize touch contamination and makes flushing easy. Coated with a water-activated lubricant to ease insertion.